What Is a Murder Mystery Dinner? 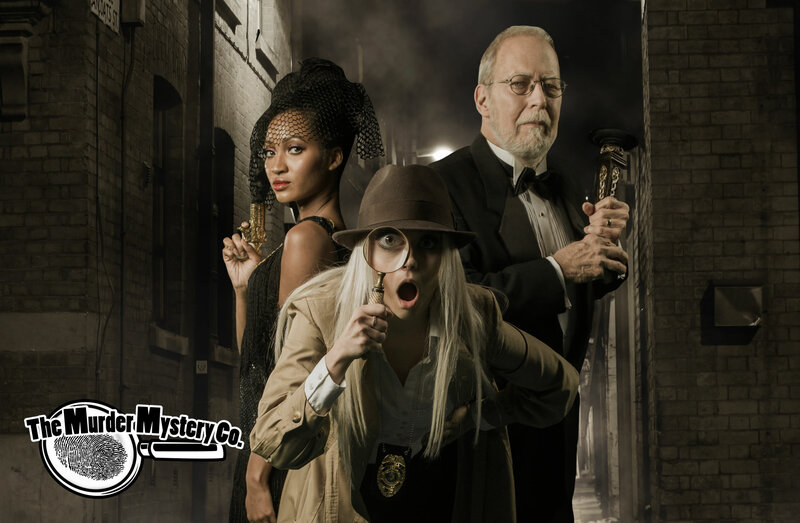 | The Murder Mystery Co.
A murder mystery dinner is a type of dinner theater in which audience members cooperate with each other and interact with performance cast members in order to solve a fictitious murder scene. Murder mystery dinner shows are most often comedic in nature and performed in coordination with the serving of a multi-course meal. The goal of a murder mystery dinner is for participants to gather clues provided throughout the plot and use them to deduce the identity and motive of the "murderer." What Happens at a Murder Mystery Dinner? If it is a fully-immersive show, guests will be welcomed into the world of the mystery by costumed actors, who will seat audience members, explain to them the rules of the game, and assign character roles. The roles played by audience participants are usually those of suspects who may have committed the crime. Props or light costuming may be offered to the guest, such as hats or glasses, to signal to other audience members that this person is involved in the show. Most frequently, guests will be on a team with the others sitting at their tables, and will work together to solve the crime. They will have goals to accomplish throughout the show to figure out which suspect committed the crime. While every murder mystery dinner is different, they will usually follow the same general template. Act One is meant to “set the scene.” Characters will be introduced and the crime will occur, or will have already occurred prior to the show’s beginning. A salad or appetizer will be served. An Investigation Time begins. This is the time in which guests begin to mingle, question the suspects, and work on their goals for the evening. Act Two will reveal more details of the mystery, and the actors may ask participants about their characters and why they might or might not have committed the crime. Dinner will be served. The second Investigation Time will occur. Participants may have new goals or will be directed to continue narrowing down their suspect lists to figure out whodunnit. Act Three will often be a rundown of the suspect lineup, giving the teams a final opportunity to discuss who they believe to be the culprit and why. Dessert will be served. Once guests have submitted their guesses, usually in the form of a worksheet, the actors will wrap up the show by revealing the culprit and explaining their motivation and opportunity.